Working in a rare, "natural seafloor laboratory" of hydrothermal vents that had just been rocked by a volcanic eruption, scientists from the Woods Hole Oceanographic Institution (WHOI) and other institutions have discovered what they believe is an undersea superhighway. This superhighway carries tiny life forms unprecedented distances to inhabit the post-eruption site. One such "pioneer species," Ctenopelta porifera, appears to have traveled more than 300 kilometers to settle at the site on the underwater mountain range known as the East Pacific Rise. "Ctenopelta had never been observed before at the study site, and the nearest known population is 350 km to the north," said Lauren Mullineaux, a senior scientist in WHOI's biology department. The discovery--in collaboration with scientists at the Lamont-Doherty Earth Observatory (LDEO) and the NOAA Pacific Marine Environmental Laboratory (PMEL)--clashes with the widely accepted assumption that when local adult life is wiped out in a hydrothermal eruption, it is replaced by a pool of tiny creatures from nearby vents. In this case, however, the larvae that re-settled the post-eruption vent area are noticeably different from the species that were destroyed, according to David Garrison, director of the National Science Foundation (NSF)'s Biological Oceanography Program. In addition, the larvae appear to have traveled great distances to reach their destination. "That raises the question of how they can possibly disperse so far," said Mullineaux. She added that the findings have implications for the wider distribution of undersea life. A report on the research by Mullineaux and her colleagues is published in the April 12 issue of the journal Proceedings of the National Academy of Sciences (PNAS). The discovery of hydrothermal vents on the bottom of the Pacific Ocean in 1977 revolutionized ideas about where and how life could exist. The seafloor vents gushing warm, mineral-rich fluids and teeming with life raised new questions that researchers have been studying ever since, including: How can so much life thrive at the sunless seafloor? What is the nature of organisms at hydrothermal vents? How do animals migrate to other vent sites? 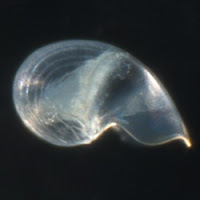 It was this last question that motivated Mullineaux and her team as they began their study of a vent area on the East Pacific Rise "to gather observations of currents, larvae and juvenile colonists in order to understand what physical processes might facilitate dispersal," Mullineaux said. One of the group's primary challenges was to determine where the organisms around the vent came from. As the scientists set out on their mission in 2006, "we got a surprise," said Mullineaux. "A seafloor eruption was detected at our study site, resulting in changes in topography and enormous disturbance to ecological communities. The eruption was, in essence, a natural experiment." By the time the researchers arrived at the site, they found a scene quite unlike that usually observed at a hydrothermal vent. Normally, such fissures are teeming with life, supported by the hot chemicals that spew from the vents and provide food through microbial chemosynthesis, a deep-sea version of photosynthesis. But at this spot on the East Pacific Rise, near 9 degrees North, there was no life. The eruption had wiped it out. "Although the vents survived, the animals did not, and virtually all the detectable invertebrate communities were paved over," said Mullineaux. "For us, this was an exciting event. In essence it was a natural clearance experiment that allowed us to explore how the elimination of local source populations affected the supply of larvae and re-colonization." What the scientists found went against the accepted assumption that most of the organisms needed to re-populate an area come from relatively nearby. But instead, the new larval inhabitants were from a considerable distance away. "These results show clearly that the species arriving after the eruption are different than those before," says Mullineaux, "with two new pioneer species, Ctenopelta porifera and Lepetodrilus tevnianus, prominent." The most important finding is that "the processes of the larval stage--as opposed to those of adult organisms--seem to control colonization," Mullineaux said. "We found that a pioneer colonization event by one species, Ctenopelta porifera, radically changed the community structure." But a question remained: How were these weak-swimming larvae propelled such vast distances to the decimated vent area? The answer may lie in a recently developed model by Mullineaux's colleagues Dennis McGillicuddy and Jim Ledwell of WHOI, Bill Lavelle of PMEL and Andreas Thurnherr of LDEO, all part of the team for an NSF-funded project called LADDER--LArval Dispersal on the Deep East Pacific Rise. Seemingly the only way the emigrating larvae could get to their new home from so far away, Mullineaux says, would be to ride ocean-bottom "jets" traveling up to 10 centimeters a second, such as those identified in the work of McGillicuddy and Thurnherr. Theoretically, however, even these ridge-crest jets might not quite be able to transport the larvae from 350 kilometers within the time frame of their 30-day lifespan, she said. "Either the larvae are using some other transport or they are living longer than we thought," said Mullineaux. She speculates that large eddies, or whirlpools of water, several hundred kilometers in diameter, may be propelling the migrating larvae even faster--delivering them to their new home while they are still alive. Or perhaps the larvae are able to somehow reduce their metabolism and extend their life. The findings present an array of fascinating scientific scenarios that warrant further exploration, according to Mullineaux. They also may open up new ways of looking at the impacts of human activities on the seafloor, such as seafloor mineral mining, which could alter a vent site in a similar way to an eruption. Such activity could conceivably foster a greater diversity of species at a vent that has just been mined, or it could cause extinction, Mullineaux said. But such scenarios are still highly speculative, she emphasized. Mullineaux's WHOI co-authors on the paper are Diane Adams, currently at the National Institutes of Health, Susan Mills and Stace Beaulieu.